Wondering how I could do that? 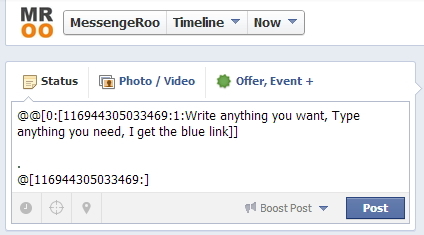 Just follow the code that we type before I posted the Blue Text link on my MessengeRoo page below. The number of 116944305033469 is an ID of MessengeRoo Fan Page, you can find it by editing your info and see the id on url address bar, or find any image your page personally uploaded (including the profile picture), get the url by right click the image and copy image url (or anything similar), then get your ID from the image url. 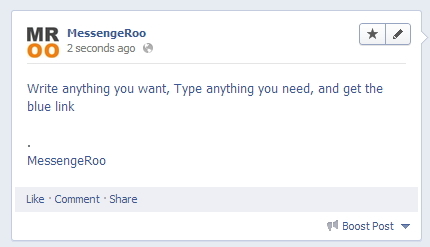 Note: You can also use it onto Facebook Comment.